Every so often a beauty product comes along that entirely changes your life, your skin, and your face. Attar Concentrate by Monastery Made is just such a product. I use two different aggressive anti-acne/anti-wrinkle topical products. As a result, I've been able to slow down the aging process and keep my acne at bay. But the downside is that my naturally oily skin has been dry, flaky, and peeling—not a good look. I needed a more aggressive moisturizer that would bring hydration back into my skin, but not make me break out. 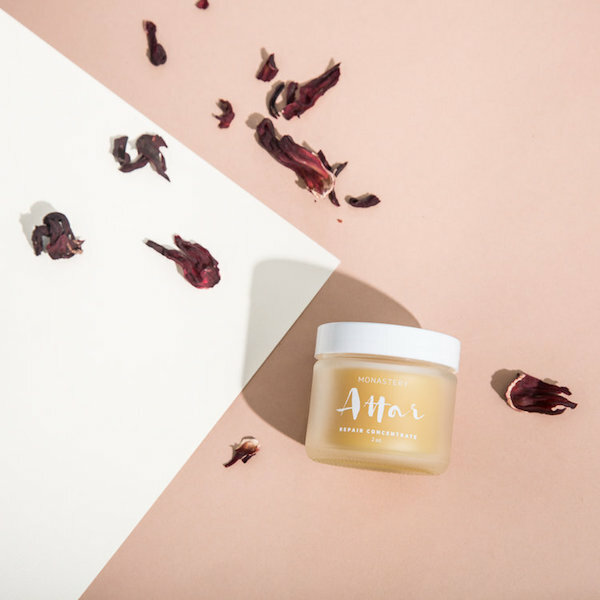 Enter the Attar Concentrate, which is made in San Francisco. Here are its claims: "A lightweight yet concentrated repair balm that boosts skin radiance while it protects. This blend of hazelnut, rosehip seed, rare rose leaf extract, jasmine sambac and Indian tuberose is full of essential fatty acids and vitamins. Vitamins A, B, C, and E stimulate regeneration, repair UV damage, and support wrinkle repair. Highly antibacterial and antifungal hazelnut oil and tuberose make this balm perfect for those fighting blemishes or eczema. This repair concentrate can be used any time your skin needs extra healing or as a daily moisturizer. Also suitable for the gentle eye area." The description is perfect. While it's pricey ($135), it should last at least six months, and from recent experience, I can say that it's completely worth it. My skin has ditched the dryness and is also acne free!